In the autumn of 1894, Cézanne accepted an invitation to visit Claude Monet at Giverny, settling nearby at the Hôtel Baudry. Other artists, including Mary Cassatt, Pierre-Auguste Renoir, and Auguste Rodin, came from Paris for gatherings that Monet organized, but despite the hospitality and the reported gaiety of these occasions, Cézanne, who was shy and uncomfortable in company, left abruptly following a misunderstanding at the end of November. 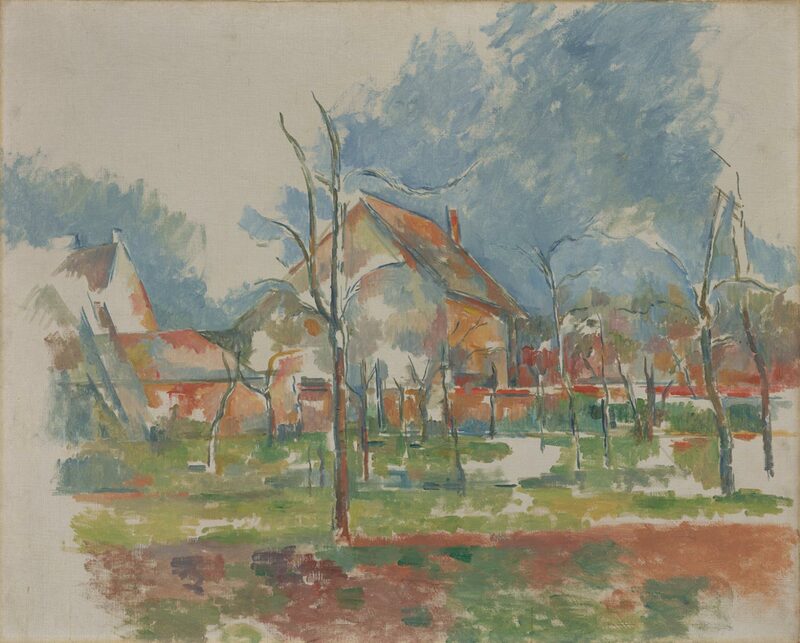 This painting of an orchard next to the hotel was left behind, and the hotel proprietress, recognizing its value, retained it as compensation for Cézanne's unpaid bill. The work is a remarkable revelation of the way in which Cézanne constructed pictures. Using a thin brush laden with gray paint, he drew the outlines of trees, the orchard wall, and the gables of adjacent buildings. Patches of pale color are thinly applied to the ground and houses, leaving areas of blank canvas around each object. Cézanne intended for these lighter underlayers to infuse the canvas with luminous color and would gradually have painted over them with darker paint. Even in its unfinished state, the picture holds together and exerts a powerful, organic pull. Jennifer A. Thompson, from Masterpieces from the Philadelphia Museum of Art: Impressionism and Modern Art (2007), p. 98. Gift from the artist to Mme. Baudy, Giverny, 1894 . Frank C. Osborn (1887-1948), Dobbs Ferry, New York, possibly before 1934 ; by inheritance to his wife Alice Newton Osborn (1888-1965), Manchester, Vermont, until d. 1965 ; bequest to PMA, 1966. 1. Owner of an inn at Giverny where Cézanne stayed between September 7-30, 1894. The painting was given to her as compensation, and she is reported to have sold it (see Vienna, Kunstforum, "Cézanne: Finished-Unfinished," exh. cat., January 20-April 25, 2000, no. 86, p. 294). Rivière, Le Maître Paul Cezanne, 1923, p. 206, and Cézanne: le peintre solitaire, 1933, p. 178, listed the painting as "coll. Pellerin" (i.e., Auguste Pellerin, 1852-1929), apparently in error. 2. The date of acquisition is unknown; however, a label on the back of the painting states that it is the property of Frank Osborn and gives his address as Dobbs Ferry, NY. Since Osborn moved permanently to Manchester, VT, c. 1933 (see letter to Carl Zigrosser, July 26, 1933, in registrar file), he probably purchased the painting around or prior to that date. 3. The painting was on loan at the museum from 1959 onward, according to PMA Bulletin, Summer 1966, p. 81.